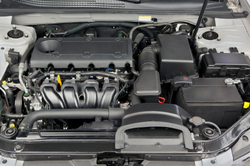 Engine services encompass a wide variety of the repairs that you may need for your car. Whether it’s a major repair or just a simple fix let us diagnose and repair your vehicles engine. Every vehicle built since 1996 has been equipped with an On-Board Diagnostics System that monitors engine performance. The computer in your vehicle stores information on components that may be failing. Once the “check engine” or “service engine” light is displayed, you should seek us out for an engine diagnostic service or an engine tune-up. Our engine diagnostics allows our staff to gain intel about the condition of your engine. The information given during an engine diagnostic can tell us what’s potentially causing a problem. The most common diagnostic trouble codes are generated due to errors in the powertrain. Ultimately, you want to have tune-ups performed regularly on your vehicle. A tune-up is also one of the most effective ways to prevent break downs and more expensive repairs. During an engine tune-up, our staff may replace the spark plugs, spark plug wires, air filter, fuel filter, and distributor cap and rotor in your vehicle. Our experts will also check emission levels, fuel lines, and belts and hoses. Engine diagnostics and regular engine tune-ups can help extend the life of your vehicle and improve the health of your engine.